Chewbeads are the perfect accessory for moms with teething babies! I have been spotting new moms wearing these cute colorful beads everywhere I go and had to give them a try. Chewbeads are a line of non-toxic chewable jewelry with chic mamas in mind. The soft beads are made of FDA approved silicon and free of BPA, PVC, phthalates, cadmimium and lead. The jewlery can be easily cleaned with soap and water or can be thrown into the dishwasher. I gave the necklaces a test run with my daughter Frances. Verdict? She loves chewing on them and now she spends less time pulling my hair. (Thank you!) They have helped her to stay focused when I breastfeed in public—she usually ducks her head out from my scarf every few seconds trying to see what is going on around her. At night, when we're calming down she will cuddle with me and inspect every individual bead. I like the necklaces because they are seriously cute and chic! When my daughter was born I put all my jewelry away thinking it would be years before I could wear anything again. I have felt safe letting her chew on the Chewbeads necklaces and they have no detachable parts so I don't worry about her accidentally swallowing a bead. The line of bracelets are great for sleep deprived moms to remind them which side they last nursed. The necklaces and bracelets are available in a range of colors and styles. I have the Bleecker necklace ($35) on in punchy pink which pairs well with all my summer tunics. 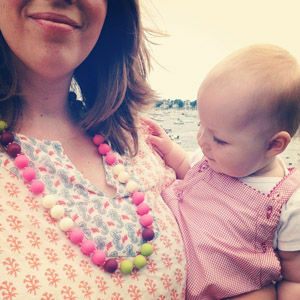 The Greenwich necklace ($37) is super cute with varied bead sizes and a great gift to give new mom friends! Find out more and where to shop at chewbeads.com. Related: Even gummy grins need care to help prevent decay.